Welcome to The Jayakarta Lombok, Beach Resort & Spa. Explore Lombok. Arouse your senses and experience the unspoiled, untouched natural beauty of Lombok Island from a front row seat at The Jayakarta Lombok Beach Resort & Spa. For your accommodation in Lombok, The Jayakarta Lombok Beach Resort & Spa is divided into a main building and several bungalow units, comprises a total of 171 rooms. Facilities on offer include a welcoming foyer with a reception, safe, and a cafe, in addition to a range of shops, a bar, and two α la carte restaurants. The cozy complex also features a library, and a business centre. A conference room and a banqueting hall may also be taken advantage of by guests, and the laundry service, medical facilities, and bicycle hire complete the offerings. Younger guests may let off steam in the play area, and the hotel has parking spaces for those arriving by car. Choices of Twin or Double Bed • Balcony • Air conditioner • Minibar • Bathroom with Bathtub & Shower (Hot & Cold Water) • Hairdryer (On Request) • Writing Table & Chairs • Coffee & Tea Making Facility • Complimentary Room Amenities. 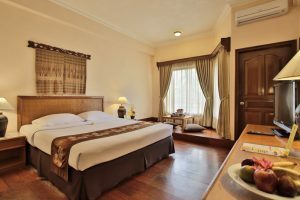 Choices of Twin or Double Bed • Wooden floor • Balcony or Terrace • Air conditioner • Minibar • Bathroom with Bathtub & Shower (Hot & Cold Water) • Hairdryer (On Request) • Writing Table & Chairs • Coffee & Tea Making Facility • Complimentary Room Amenities. 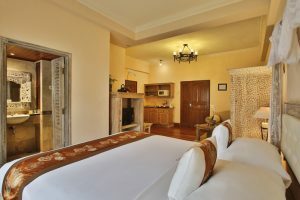 Choices of Twin or Double Bed • Balcony or Terrace • Air conditioner • Minibar • Wardrobe • Bathroom with Bathtub & Shower (Hot & Cold Water) • Hairdryer (On Request) • Writing Table & Chairs • Coffee & Tea Making Facility • Complimentary Room Amenities. Double Bed • Balcony • Wooden Floor • Air conditioner • Minibar • Wardrobe • Bathroom with Bathtub & Shower (Hot & Cold Water) • Hairdryer (On Request) • Writing Table & Chairs • Mini Kitchenette • Microwave • Sofa Bed • Coffee & Tea Making Facility • Complimentary Room Amenities. Double Bed • Balcony • Living Room • Air conditioner • Minibar • Wardrobe • Bathroom with Bathtub & Shower (Hot & Cold Water) • Hairdryer (On Request) • Writing Table & Chairs • Mini Kitchenette • Microwave • Sofa Bed • Coffee & Tea Making Facility • Complimentary Room Amenities. The Jayakarta Lombok Beach Resort & Spa is a beach front resort and is only 20 minutes drive from Mataram City, 15 minutes drive from Senggigi Night Live Attractions. From Lombok International Airport about 60 minutes driving (43 km). From Lembar Harbour about 28 km, 50 minutes driving.